For those who enjoy the outdoors, you can swim, bring your own canoe or kayak and depart directly from our private dock and explore the cove and surrounding inlets. There are plenty of nearby areas for hiking, biking, fishing and sailing. 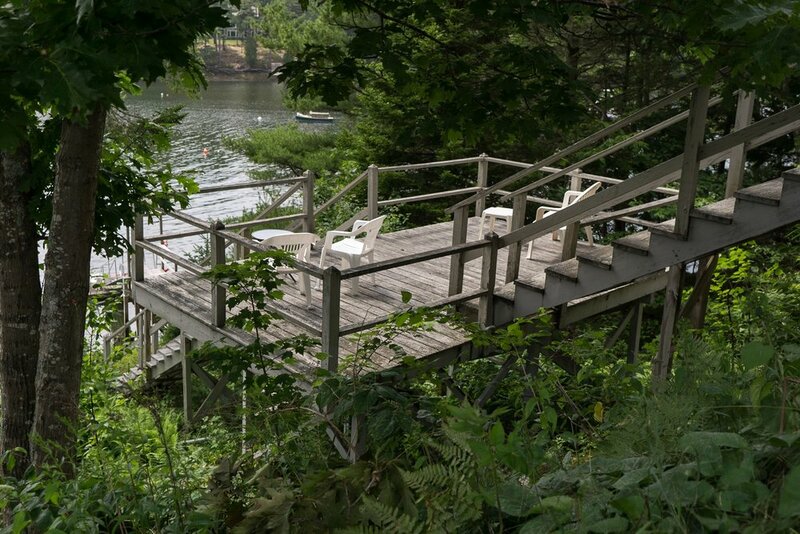 After a day of swimming and strolling at Popham Beach, retire to the deck to enjoy the breeze and watch the sun set over Brigham's Cove and Winnegance Bay. Then come inside to enjoy lobsters or grilled swordfish as you look out to the water through the floor to ceiling windows. Adults can have a peaceful conversation in the main living area while children watch their favorite shows in the adjoining TV room. Brigham's Cove is peaceful and quiet, yet it's very close to all the amenities of the mid-coast including Historic Bath and the Maine Maritime Museum, the eclectic college town of Brunswick, and Freeport--home to LL Bean and name brand outlet shops. Reid State park is also nearby, and Portland and Camden are about an hour from the house. Acadia National Park is just 3 hours away in Bar Harbor. The house has 4 airy bedrooms upstairs. New wood floors and painted rooms. The master bedroom with king bed opens to the upper balcony. A renovated full bathroom upstairs. There are 2 queen bedrooms and a 4th bedroom with two extra long twin beds. The recently renovated downstairs 3/4 bath has an oversized walk-in shower. The newly renovated kitchen is well equipped and there is a separate laundry room. TV and WIFI available. The home will accommodate 2-8 people comfortably. "This home was a wonderful setting for our family gathering of 8 people. We cooked lots of blueberry pancakes in the brand new well stocked kitchen and grilled many dinners outside on the deck. Evenings were spent playing games around the generously sized dining room table. Our 8 and 10 year old grandchildren had fun fishing ( we only caught crabs) from the dock, but really loved Popham Beach State Park, 20 minutes away. The location was a perfect launching point for day trips to the Coastal Maine Botanical Garden in Boothbay, LLBean in Freeport and our son's favorite brewery in Portland. Our CA daughter- in- law got her fill of lobster at various local restaurants and we found a Bait and Tackle shop on 209 that had the best homemade pies. It was a wonderful week in a very comfortable home." "We have been having such a good time at this place that we are booking for the 3rd time. The house is perfect. Nice view, well equipped kitchen, spacious rooms, comfortable furniture. Always find the house to be clean and well stocked with essentials. There are plenty of movies for that rainy day. We love sitting at the dining room table and watching for Eagles and other wildlife. Just beautiful! There are plenty of good restaurants close by. We try to find ones that we can visit by boat..."